Alex Georgiev had himself a night last night. The Rangers got utterly shellacked by the clearly superior Leafs, but Georgiev stopped 55 of 56 shots, stealing one for the Blueshirts. 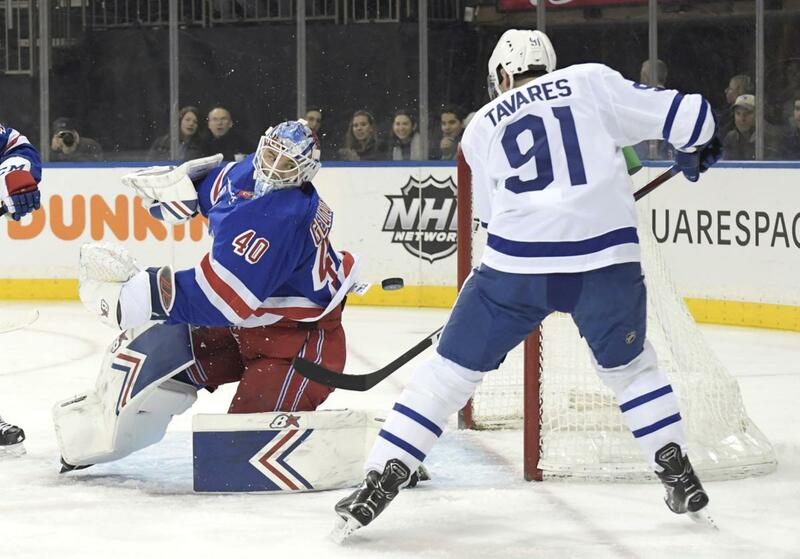 While Georgiev clearly stole this one, the Blueshirts had extended periods of pressure against the Leafs. They also forced a few turnovers and turned them into goals. Chris Kreider reads the play here and just picks off Morgan Reilly’s pass down low. At this point, the Leafs are scrambling, and Kreider gets the puck in front to Mats Zuccarello for two attempts that Garrett Sparks got. The third one went to Mika ZIbanejad, who buried it. This was a horrible pass by Tony DeAngelo to spring Kasperi Kapanen on the break. That was a great shot. Jimmy Vesey created the turnover in the defensive zone as the penalty to Kreider expired, and then transitioned the puck to Ryan Strome to start the rush. Kreider jumped out of the box to join in, and then fed Vesey perfectly with the cross-ice pass. Vesey just had to finish. Zuccarello picks off the Jake Muzzin outlet, and the puck gets to Adam McQuaid at the point. His wrister beat Sparks through a screen by Auston Matthews. Considering the shot differentials, this actually isn’t as bad as you would think. There were clearly a ton of shots from the right side of the ice, as that’s where Toronto focused their attack from. This was a win that the Rangers got because of their goaltender, but it’s not like they played overly bad. They had a good offensive showing in this one as well. Positivity, right? The Blueshirts had to Winnipeg for one night on Tuesday, then come back to the East coast for the last three games of their four game road trip. "Georgiev gets 55 birthday saves and steals one for the Rangers", 5 out of 5 based on 4 ratings. ← Game 55: Are we watching the last home game with several Rangers? That being said, 5 on 5 was pretty even. Last home games for Hayes and Zuc? Maybe more? Next home game is Feb 21. Actually Richter I thought the Rangers were better then the Leafs 5 on 5, which was reflected on the scoreboard. The Leafs got the majority of their shots and scoring opportunities on their PP. And thanks to some ticky tacky calls they had several of them. Georgi rose to the occasion in this one and stopped everything in sight: except a clear breakaway as the result of DeAngelo give away. yeah, the Rangers 5 on 5 were actually fine. Everyone is available, but I think that he stays. If Gorton really wants to impress all of us, then he somehow unloads all the crap contracts on the back end. The flaw on the team starts with (and actually ends with) paying $27M in cap space and getting nothing in return, from the D corps. Oh, and adding a goal scoring winger wouldn’t hurt either. If Zuc does not get re-signed then it’s because of his refusal to shoot the puck. pass first culture is what is still holding this org back. I saw buch guilty of it too last game. he has great role models for it though. hopefully they are gone in 2 weeks. on defense, in 2 years contractually 75% of it will be gone. clear cap space, get better players. I guess the Ranger D corps reads this blog based on the thumbs down, lol. Na, I took a swipe at the ?? fan faves. Well Too Bad lol. G was unreal facing 365 shots and yielding just 1 goal…….seriously the defense has to be revamped…. But we won the game and beat the Leafs, so we must be really good. I really hope and pray that Gorton’s priority is not impressing us. Having said that, what you have asked for is easier said then done. I believe we are on the right track, I just don’t want anyone to panic, most of all Gorton. Slow and steady wins the race folks, it’s going to be couple more years. That’s ok though, it for the strength of the Org. long term. Patience is a virtue. Well Joseph, I was not being literal about Gorton impressing us. And yes, overall, I agree that we have to wait until next season, at least, to see where the team is going. goalies stealing games – the single reason why nyr the last decade havnt been able to amass cup winning talent. hockey is unforgivable in that way I guess. I hope they change the draft system soon, I cant go through this much longer. If you can’t take it, don’t watch it, and maybe stop posting about it. Because you say the same negative crap in every post you make. Maybe you can refresh your “insight” by becoming a Leafs fan instead. one more save last night and he would have had two for each year he’s been alive. What a performance he put on last night. on their first couple of power plays they peppered the net and he was like..it ain’t happening. Good for him. He looked great. The Ranger penalty kill was brutal. Georgi was good. 23×2=46. Way over 2 per year that he has been alive. Worst game in a long time for DeAngelo. Disappointing how he played against top level competition. The defense in general was incredibly overmatched by Toronto’s offense, Georgiev was fantastic last night. Sounds like a positive take to me! you could have just CTRL V’d that whole comment actually. That’s clever, you write jokes now too instead of stale and grouchy warmed-over remarks. At least my concern with this team is sincere and realistic—the defense is legitimately bottom 3 in the entire NHL. You on the other hand harp on skilled players who actually perform well for the Rangers. Like Mats Zuccarello, a really good Ranger, who once suffered a fractured skull in the service of the Rangers that jeopardized his longterm well-being. Like Mats Zuccarello, whose athleticism is such that he plays a physical game like hockey while being five feet seven inches tall. Like Mats Zuccarello, a classy and inspiring hockey player, whose bond with real NY Ranger fans is strong and self-evident. Got any other clever remarks for me? Cut the kid some slack, he was bound to have ONE bad game. You believe like I do that DeAngelo is a keeper as a player, and it would’ve been encouraging to see him play well against one of the best forward groups on the planet right now. He played poorly last night. A bad offensive zone penalty, a turnover that led directly to a Toronto goal, and overall he looked like he wasn’t as decisive with the puck as he’s been of late. I’m sure he’ll shake it off, but he sucked last night and deserves the call-out. No need to sugarcoat a bad game, and DeAngelo will be hearing it from Quinn at next practice I bet. He played well against Boston so it kind of evens out … but I agree with you, he’s a keeper and he had a bad game against one of the best forward groups in the NHL — hopefully he learns from it without getting banished to the press box. I’m sure he will have several more, as will most of the Rangers youth movement players, that’s called development. It takes time to “develop” into a top tier pro hockey player. How do we feel about Mika’s development, now? Looks pretty good doesn’t he? Dare I say he may be “developing” into an elite 1C? This rebuild needs for us to have patience. Let’s try supporting the team, Mgmt., and each other. Less sniping, we could have differing opinions without resorting to being mean. Let’s try something, if you wouldn’t say it to the persons face, then don’t write it here. Be part of the solution of the problems in this country, not creating more. Truth be told, ADA has not been good for the last 3 games. And this is why the stats are BS, in Friday’s game I do not think that ADA was charged with any giveaways, when in fact, he had 2 on one shift. #40 – shut em down eh! it’s time the club pulls off some bandaids and faces the rebuild head on. #22 what a disappointment. We need D, and how! Shame to see this team let go of players that are this exciting night after night, ya gotta do what cha gotta do! Georgiev saves and nobody scores on the rebound! Wow the kid was simply lights out last night. Nobody was going to spoil his birthday party. Mika continues to be on fire! DeAngelo had a tough night. Since it was the first one in a long time, chalk it up to a bad night. They all have them unless your last name is Gretzky. If you stop and think about who ADA plays with. It’s a tough night every night. Same goes with Pionk. He’s always been paired with the traffic cone and honestly they go as a top pair when they should be playing 3rd pair. We have no choice cause really all the D are 3 rd pair tops. Pionk and ADA are the future bottom 4. Skjei should be moved out just as fast as Smith will be. Georgiev is playing so well right now that I could see a goalie-needy team making a cursory call to Gorton on his availability. If we could pair him up with a bad contract, or significantly increase the value of one of our rentals I think I might do it. Again, his perceived value and upside look really good. Hank’s not going anywhere, maybe strike while the iron is hot. The jury’s still out on Lias… quick quiz: 1. who’s ahead in the scoring race… Stepan or Vesey? 2. Who has the 5 mil + cap hit in a NTC? 3. Name one of the most (if not the most) injury prone goalies in the NHL? 4. Name the defenseman from that trade that I probably wouldn’t trade back to AZ straight up for Stepan? Last question… would you make that SAME trade again today? hey I liked the framework of the trade. I don’t/didnt think stepan alone gets you a top ten pick. The execution just sours it. Here you sum up every ranger fan’s thought process. Hence 1 cup in almost 80 years. And at this rate lets all be honest next one is going to come well after 80 years. Did we trade Stepan and get Vesey? Does Vesey even play the same position? What did we do with that free cash after the trade? Did we sign some free agent center to a deal to fill the obvious void? Do you seriously think Arizona would take that trade if we paid them to take DeAngelo back? Does anyone even know just how bad Lias has been since he went back down? Shatty is a flop. Lias was a wasted pick -20 since being in the AHL. And ADA has had his moments but until just recently was riding the pine more times than not. And as soon as Cleasson is healthy guess who is going to be back on the bench? So yeah who won that trade? And if you played for the worst defensive team in the league as a goalie you would get hurt a lot too. So if this was a trade to free up cash so we could sign Shatty….who would you rather have shatty or stepan? I know my answer! Was the trade the right thing to do….hindsight says yes cause we will never know how stepan’s next 5 years would have played out for us vs. how the actually are playing out for him with Arizona. But look at the Islanders….did anyone see them in first place this year after they lost their number 1 center for nothing? But firing a horrible GM and coach and hiring one of the best coaches in the NHL has done wonders for them. And crosby and Malkin were one of the best 1,2 center combo’s in the league for a decade but yet til they fired their coach and hired mike sullivan they could never get past the 2nd round either. My point is …til the players you have actually believe in the coach and the front office/ownership …said team will never go anywhere. This is evident in every cellar dwelling team in the league. And the opposite is true with every front runner for the cup. Islanders being the most blatant example this year. Vegas last year. Edmonton, Carolina, the old islanders, all had/have horrible front offices/ownership. Not maxing out to the cap or even coming close. Letting star prospects walk in free agency. Making horrible draft picks at horrendous times. Trading away character players for nothing in return. Paying a new free agent defensemen more then your star defensemen that has been true to your franchise for years. Then trading away his BF to the worst franchise in the league for nothing. And cutting his other hockey BF cause he is hurting from all the sacrifices he made during the playoffs. These are moves then undermine your team. These are moves that make players regret taking a pay cut to stay with your franchise. That leadership group was lost at that exact moment. Just took the front office several months to figure it out. How can you be that stupid? I know how ….we will trade Hagelin for a Etem and then go trade him for prospects that panned out so well they went back to europe. So far the only move that looks good is the Brassard move to Zibanejad and even that the first 2 years looked very one sided against. Oh I got another good one…we will let Stralman walk for nothing cause his asking price was to high and will sign Dan Boyle for 3 times his asking price and watch him flop around for next 2 years til he is forced to retire cause he is so bad. And here we are moments away from another trade deadline talking about trading away our best players one which is universally respected for his heart and soul to this game ………..instead of talking about how badly we should fire our Gm/President. Fire lindy ruff. And trade away every underperforming player on this roster for picks even if we only get 7th round picks for them. What would be a acceptable return in your eyes for Shattenkirk? I would accept a 4th or 5th rounder at this point. Hell a prospect in my eyes would be a score! But maybe I am wrong …maybe Lindy Ruff is the sole reason these guys are allowing 500 shots against a game. Yet we will never know cause he is part of the good ole boys crew and can’t even lose his job. Cause every Rangers fans blames the player not the worst front office in the business now that Chiraelli is gone in Edmonton. And look at that even Chiraelli has won a cup in the last decade but Sather is still around and hasn’t won a darn thing! First off you really came at me for a tongue in cheek quiz that I did for the fun of it and no Step and Vesey don’t play the same position. Second… would I’ve moved Stepan to sign Shatty? Hindsight probably says no, but at the time it was almost a universally approved good idea, maybe even you weren’t against it at the time. And the thought of him and McDonagh as a front pair was awesome. Thirdly Raanta is a supremely injury prone athlete regardless. Fourth… The jury is STILL out on Lias, and if you’re going to castigate his play based on an eminently fucked up Hartford team go ahead. Not to mention how his career so far has been a bit of a confusion… to him and me. Do we all feel that the FO plus Ruff are awful? Well, that’s rhetorical isn’t it? And as for trading McDonagh, it was a product of the FO flops that i can say we’re most likely well intended, and now the promise of a rebuild that they’ll probably screw up anyway. We’ve had a pretty good run but we’re all pissed we didn’t get the cup. I get it. I’m frustrated too. We are now paying the piper, but trading Stepan wasn’t the instigator of this demise. Wondering if we need to play with 8 defenseman and 10 forwards. Bring back up the kid from Hartford and put him in the rotation. Can we be any worse on D? Plus DQ has been rolling mostly 3 lines anyway. Maybe Staal and Shatty need more recovery time. Give them 3 or 4 shifts a period.